Hi, I’m Melsenpai, & I have a problem. That’s how these confessions usually start off, right? Well, to really get into it, I do have a problem…a stationery hoarding problem. It mostly revolves around postcards & pens, but today I will only be focusing on pens. This all started when I was a small child back in the mid 80s. My aunts & uncles from Japan would always send my parents presents & snacks from overseas, & they would often include small trinkets for my sister & I (mostly Sanrio/Hello Kitty related). Also at that time, my sister’s dad (my mom’s ex-husband) used to manufacture licensed Sanrio merchandise. So, my sister would always get a whole bunch of free Sanrio stuff, which she would pass on to me if she didn’t want them or got bored of them. That really jump started my huge obsession/fanaticism/passion for practically ALL THINGS SANRIO. Then, when you couple this with my habit of hoarding (a.k.a. not wanting to give away or throw away any of my toys & things), that’s where the snowball effect came into play. What I am about to show is only a portion of my pen collection (with a couple of mechanical pencils thrown into the mix). I’ve got many more pens scattered around the house & stashed away in old storage boxes. 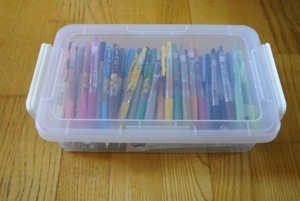 A while back I got this large craft box from the Container Store & quickly filled it with stickers, pens & other supplies. That is what the box looked like before I went nuts. Over the course of one year plus that box became cramped, dare I say…too small. 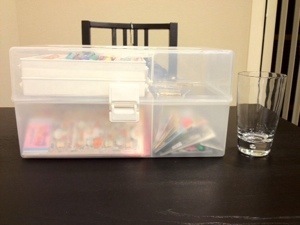 I filled up that box with what my husband would call “useless junk”…but I would call them my treasures! 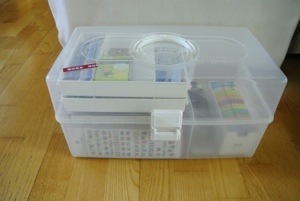 After my last few trips to Tokyo, this is what my craft box has become. I had to take out all of my pens. They were becoming unruly & kept falling out every time I opened the box. 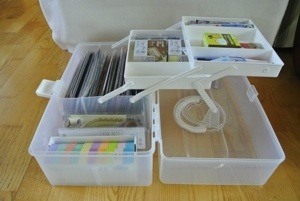 This box now houses a majority of my stickers & a few washi masking tapes. Trevor is slowly being filled up as well. However, despite all of my “hoarding”, I DO, in fact, use all of these things. I don’t just collect them for the fun of it. I actually use the stationery I buy. Though it may take a long time for me to use them all. I keep adding to my stockpile before I can finish them. Oh well. Cheers.